Each tire performs different tasks (such as steering in front- versus rear -wheel drive), therefore tires wear at different rates. Jim Tubman Chevrolet Certified Service Technicians will rotate your tires every 8,000-13,000 kilometres to ensure maximum tread life and save you money on premature tire replacement. It’s important to rotate your tires according to the correct tire-rotation pattern. Doing so will prolong the life of your tires and reduce the risk of sudden tire failure. 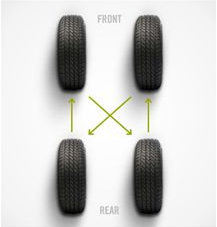 Pattern for front-wheel drive with same size front and rear non-directional tires. Pattern for all-wheel/4-wheel/rear-wheel drive vehicles with same size front and rear non-directional tires. Pattern for different size tires on the front tire and rear and non-directional tires.